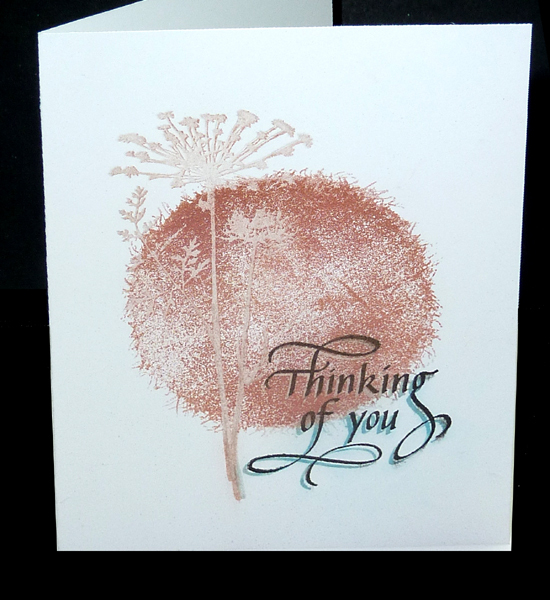 Hello blog friends, Terre here with a fabulous card, I really like this one! I just love this stamp and you can find it right here at Quietfire Designs, "Sometimes, said Pooh" when ever I read this sentiment it just makes me smile! 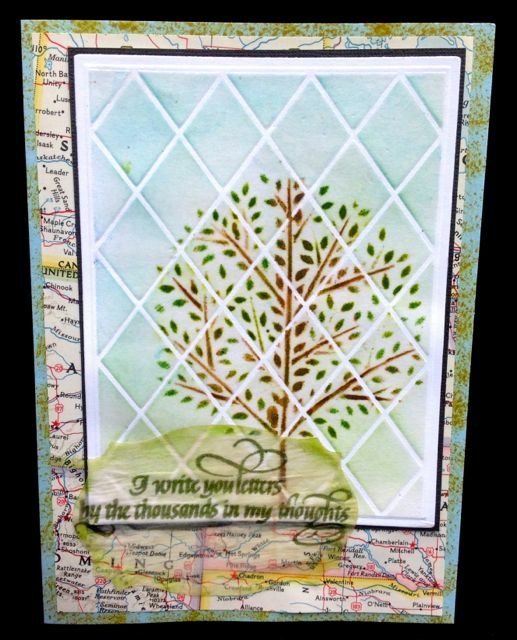 I used Spellbinders Framed Labels One M-Bossabilities, S4-328 Foliage and S4-161 Labels One die template to create my card front. I airbrushed a hint of mauve, purple and gray to the card front then added some DecoArts Metallic Lustre in Bronze, Black and Champagne and blended it over the embossed areas, once the blended was complete I took my Tsukineko Memento Black ink pad and lightly ran it over the embossed areas to highlight it in black. 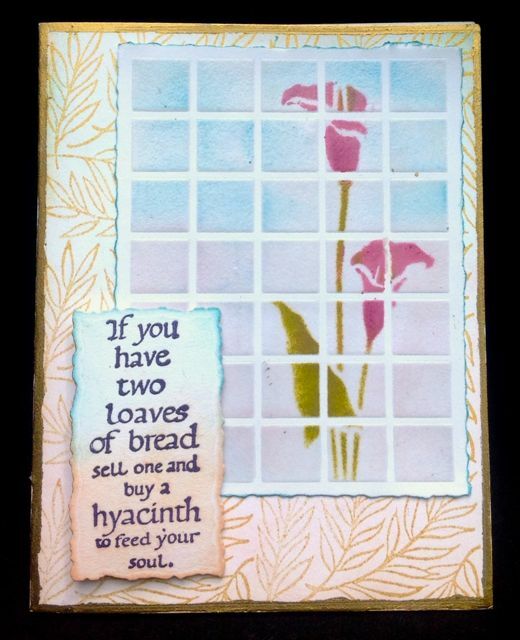 Robyn here with two quick cards from stash with two of my favorite Quietfire Design quotes. 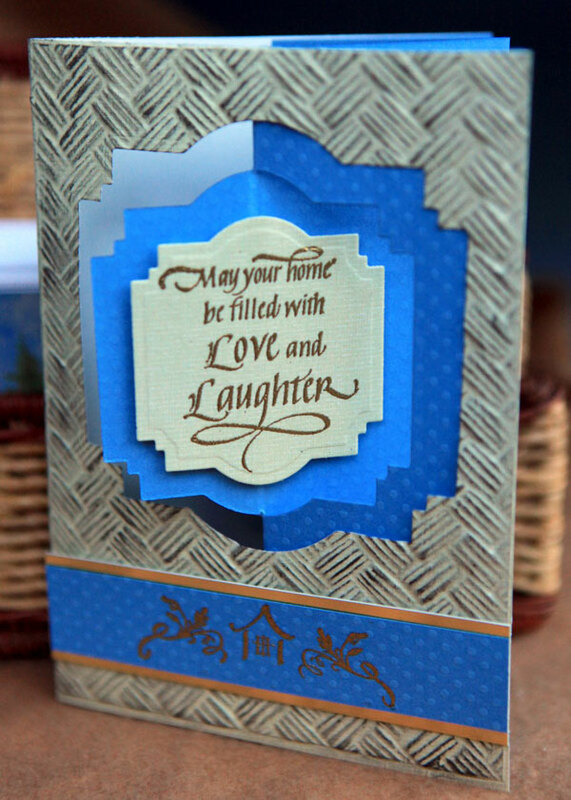 Both cards use the faux tile technique with Dreamweaver Stencils. This quote is thermal embossed in Versafine Imperial purple and I cut the label with my new digital cutter!!!!! Run the grid stencil through your die cut or embossing machine, then tape it in place , tape another stencil on top and color. Let it dry well, then with the grid stencil in place sponge on embossing ink , take off the stencil and clear emboss. I thermal embossed this quote on tracing paper so you could see the background. The stencil is a bit detailed for this technique, and I was still fairly pleased with the result. I constantly find new ways to use my Quietfire Design stamps- no dust on their rubber! New stamps coming soon- please come back and visit us here often! Yogi here today with a clean and simple card... 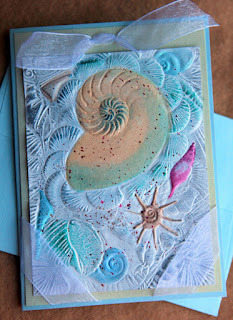 I've often done the Perfect Medium/Perfect Pearls technique, but I don't recall ever trying to do additional stamping and lifting, so that was the experiment I tried on this card. I like the simplicity of it and hope you give it a try. My card is 110# basic white cardstock (Staples brand), side folded to 4.25"w x 5.5"h.
I stamped the thread edged solid circle (Lost Coast Rubber "Shadow Frame" set) with a juicy Perfect Medium pad (can use other clear embossing pads like Versamark etc) and the applied my Perfect Pearls "Rust" all over the circle area using a soft paintbrush. Try to stay away from applying the Pearls to other areas of your white card. Flick off excess Pearls from card. 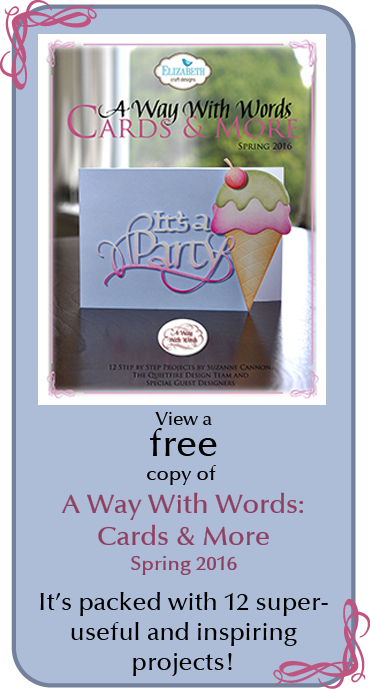 Ink up a complimentary solid type image stamp with Perfect Medium and stamp so that part of the image falls within your circle and some falls outside the circle. I used a clear stamp (Inkadinkado "Meadow" set) so I wouldn't need a stamp positioner to double stamp my image. I then carefully dusted Perfect Pearls "Rust" on the image outside of the circle, making sure my Pearls didn't color the lifted colors from the circle. Flick off excess Pearls. Ink up stamp again with the Perfect Medium and re-stamp the image a hair's breath off set. PS don't clean your stamp between inking. 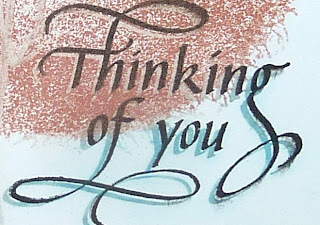 Stamped the smaller sentiment from the "Thinking of You" set (Quietfire Design) with the Perfect Medium and colored the outside portion with "Blue Raspberry" Perfect Pearls. Flicked off excess. Then re-stamped the sentiment using Versafine Black Onyx and a stamp positioner, off setting the words slightly. Enjoy playing with this technique. 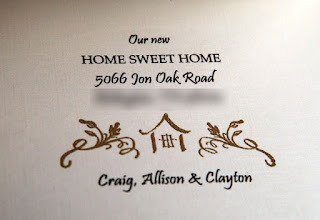 For my second designer guest post for this month, I chose to use the new Home-Congratulations Stamp Set (SKU-5924) along with some Spellbinders die (Nestabilities Labels 22). 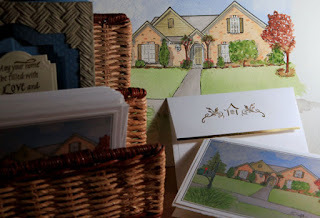 I will often create a set of "new home" notes for a friend that has purchased a new home, first taking a photograph, painting a watercolor painting, scanning the image and making A2 sized cards. 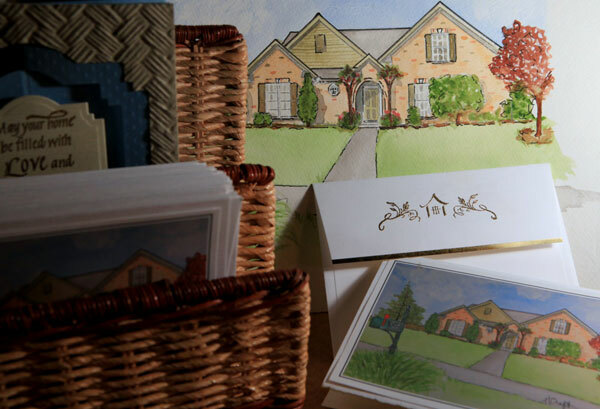 For this gift, I also make a "Congratulations on your new home" card to accompany the gift. This stamp set is perfect for the lever card I have chosen to make. A friend recently posted a tutorial for a lever card on the newsletter of a popular stamping website (Split Coast Stampers - click here to go to the tutorial). I took her instructions and made them my own by enlarging the size of the card to 5 by 7 inches and using die to cut the openings in the front of the card. I combined the Quietfire images with Spellbinders die and M-Bossibilities to create this "Congratulations" card. The mechanics of the card are easier than they look. 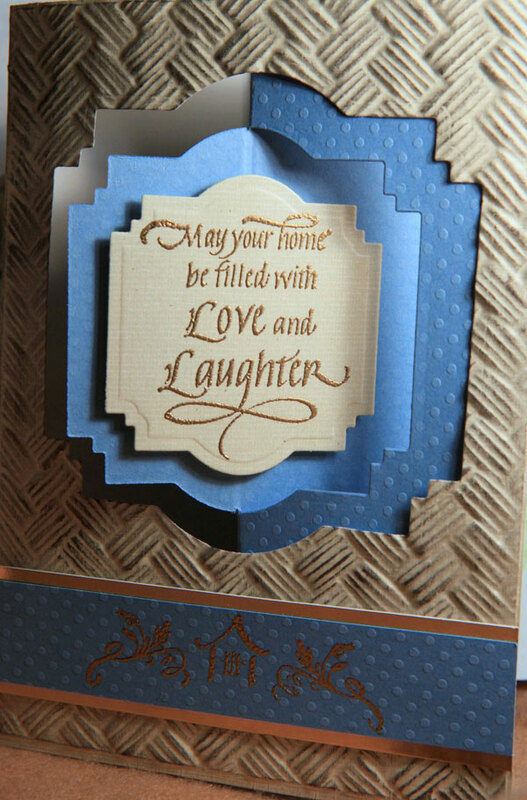 The card consists of two pieces of cardstock along with the verse stamped and cut on a smaller diecut. I also used the most versatile house image as an embellishment. I cut the outside portion of the 5 by 7 card, diecut an opening with the larger of the three Labels 22 die that I used and then embossed with the 3D Basket Weave (SKU 7586-E3D-004) on the front portion of the card. I think of baskets as a texture you would find in a home so I thought that was appropriate. The inside card is the same size, but scored in quarters rather than just in half. The scores are made into valley, mountain, valley. The opening cut in the front with the second largest Labels 22 die is cut so that only half of it cuts, thus creating the lever. There are two ways to accomplish cutting a portion of a die, that I can think of doing. First, position the die in the desired position and then hang the portion off the base plate that you do not want to be cut. Only the portion that is between the cutting mats will cut. Tape it in place before running it through your diecutting machine. The other way to do it is to place the tan polymer mat up to the score line that you are cutting to. Slowly feed the portion into the diecutting machine that you want cut until you feel the resistance caused by the tan polymer mat. That portion will be too thick and you will be able to feel that and back out the plates. Either way works great so it is a matter of preference. 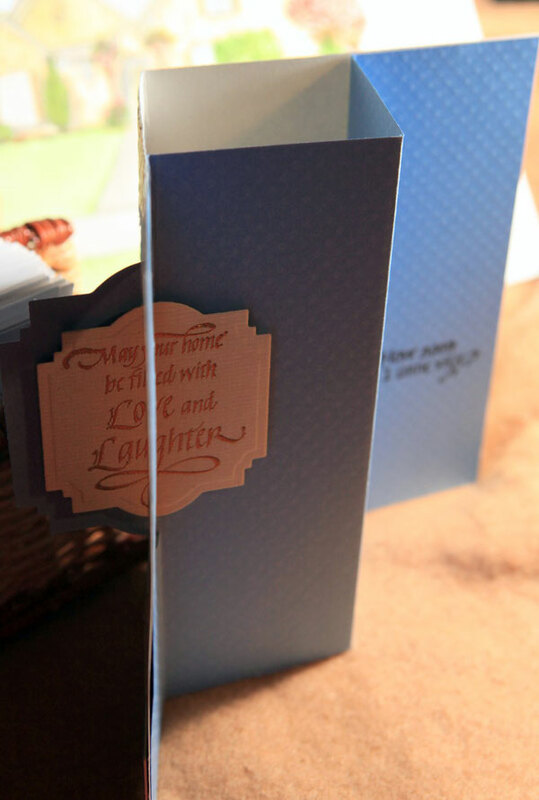 Once I have the front and inside diecut, I stamped my greetings inside and secured the very front and very back portions of the card pieces to each other. You can see in the photo that the middle portion separates in the folding process. I embellished the front with the verse on the smallest of the Labels 2 die I used and a band stamped with the house image. This lever card design works so well with the beautiful sayings from Quietfire and Spellbinders die. Choose a die that the desired saying fits on and get started! 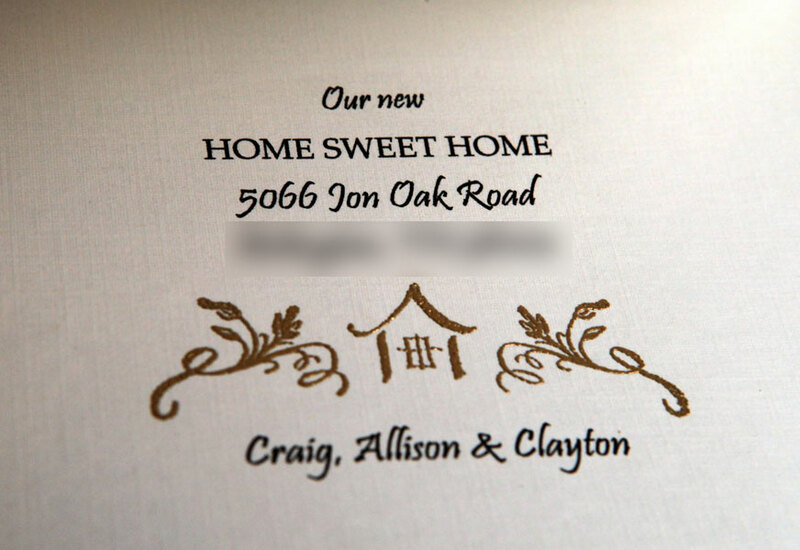 I also used the house image on the inside of the "new home" note, leaving a space in my computer generated message to add this touch of gold. As well, I used it on the back of the envelope above the gold stripe on the envelope. This use of a stamped images allows me to add that touch of sparkle that the metallic gold adds which would not be possible with just the computer generated text. As often is the case, Quietfire stamp sets include a stamp that is so versatile that it has many uses. 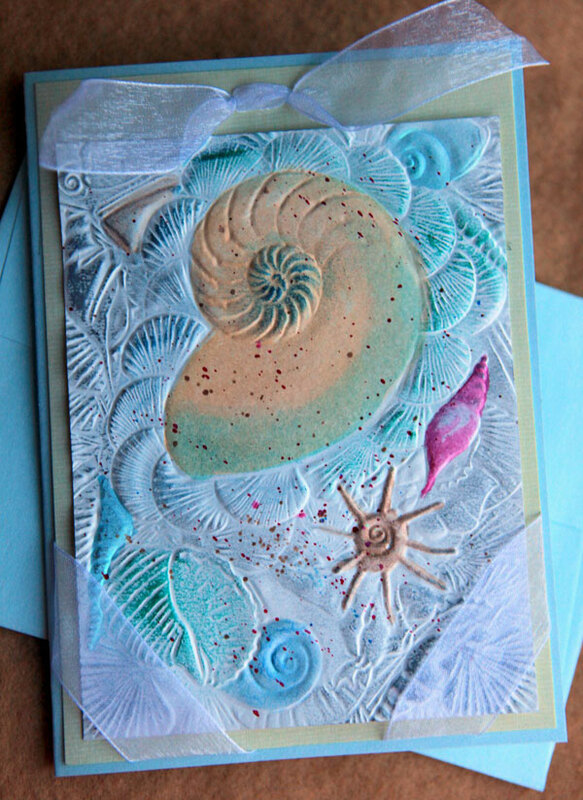 On this shell card for a beach wedding, I simply stamped "Congratulations" inside the card in that elegant Quietfire look. 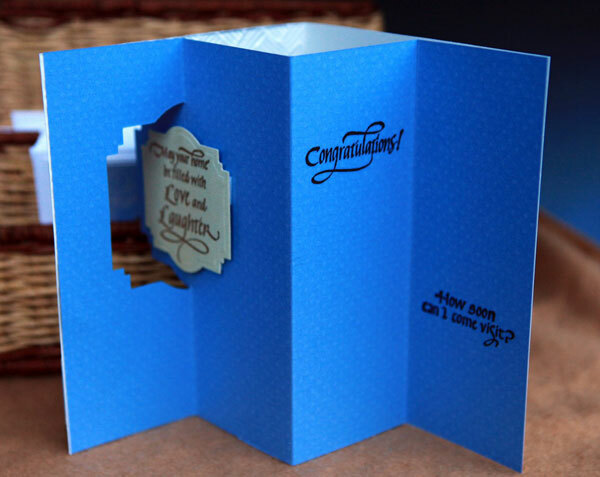 I thought the outside (created with Spellbinders 3D Shell Beauty M-Bossibilites) complexity needed simplicity inside and that beautiful Congratulations image provides that. These are all projects and cards from my real life that show I use Quietfire and Spellbinders products together so very often. You might not do watercolor paintings, but I am sure you can use this stamp set! I was so excited to see this set as there are few home stamps available. Hope you have enjoyed my postings! Garden Delights Mixed Media Tag! Good morning! Sherry here with you today and I have a mixed media tag to share that was absolute fun to create. 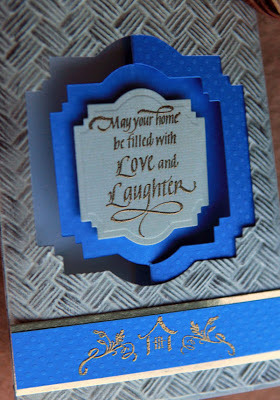 Before adding anything else to the background white ink was sprayed over the tag using a stencil created from chipboard using Spellbinders® Grateful Lattice. The heart was another stencil created from chipboard using Spellbinders Classic Hearts. The stencil was taped to the tag with painters tape and Barn Door Distress Ink was added with a stencil brush. 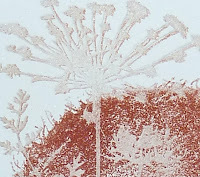 The flower stem was made using a stencil and adding embossing paste that had been tinted with Peeled Paint Distress Ink Refill. The flower itself was watercolor paper die cut/embossed with Spellbinders Jewel Flower and Flourishes. The flower was colored with Wild Honey and Barn Door Distress Stain, with some highlights of Wild Honey paint. Once assembled, the flower was misted with a red ink spray to bring to bring out the red tones. The sentiment from Garden Delights was stamped in Adirondack Pitch Black Pigment and embossed with clear. The ribbon was dyed with Barn Door Distress Ink. The ribbon embellishment is the smallest circle bezel from the Spellbinders Media Mixage line. A bee was die cut from Graphic 45 Olde Curiosity Shoppe paper with the Media Mixage Circles One and placed in the bezel. For some reason I couldn’t find my melting pot, so I dropped some UTEE into the bezel and began heating it with my heat gun. While the UTEE was still hot, I continued to add more UTEE until I had the bezel filled. Dreamweaver Embossing Paste, 4 oz. Graphic 45, Olde Curiosity Shoppe , 12x12"
Gesso, Golden White, 8 oz. Hi Everyone! It's Holly here, with a card that says Happy Birthday, but you could just as easily stamp Thank You or some other sentiment stamp from Quietfire Design. CLASSIC SCALLOP- EDGEABILITIES created the edges for two long strips, and a small snowflake created the flowers. Any die with a small flower shape will work here. If you noticed the shine in the base paper and the polka dots, you're seeing the gloss and foil on some of the papers in the paper pad. I really like how the papers coordinate with each other, making this a quick and easy card. Hello Everyone, Terre here and I know what you all are thinking.....just what is she showing us now! Well I really love creating mini albums just like the one you see here! I have to show you all the pages because I used the amazing stamps from Quietfire Designs in with the amazing chipboard albums from Want2Scrap. Did you also notice the paper collection is from Graphic 45? Look I told you there was Quietfire Design stamps in my album....lol! For this album I used the "Garden Delight" stamp set, it just went so perfect with the pattern paper from G45. What is nice about this stamp set is there are 8 stamps in the set, so much creativity in just one stamp set.